Hello strangers! It has been way too long! What a crazy and hectic summer it has been with my poor blog being very neglected. I had two huge freelance projects, a son preparing for his first year in college, a daughter involved with two competitive sports and a husband who works in Palm Springs and commutes to San Diego once a week. Sheesh! On top of that we had three great family trips. The four of us visited extended family, which makes me feel all warm and fuzzy, which I gotta tell you, I need a big dose of warm and fuzzy right now! My son is leaving in September and my husband will still be in Palm Springs and I really don't do well with transition. Luckily, I will have my daughter Eva and my dog Ty to cuddle with. Therefore I have been focusing on keeping very healthy by eating well, exercising and getting my namaste on! Aurorae Yoga asked me to try out one of their yoga mats. The Aurorae product line is amazing. Aurorae sells the best reviewed yoga mats, yoga apparel, and yoga and meditation accessories online. You can browse their yoga line here. Since I only having a bloggers budget and limited schedule, I practice most of my yoga at home off of some wonderful online sites that have an array of classes for all levels. Best part - they are free! My two favorite sites are Do Yoga With Me and Grokker. With my Aurorae mat and some comfy clothes I am ready for yoga bliss. My next healthy pursuit is to improve the quality of our family breakfast. Therefore, this delicious baked summer fruit oatmeal. It is packed with whole grains (gluten free option), beautiful summer berries, peaches, protein and is low in sugar. It's easy, filling and darn right tasty. 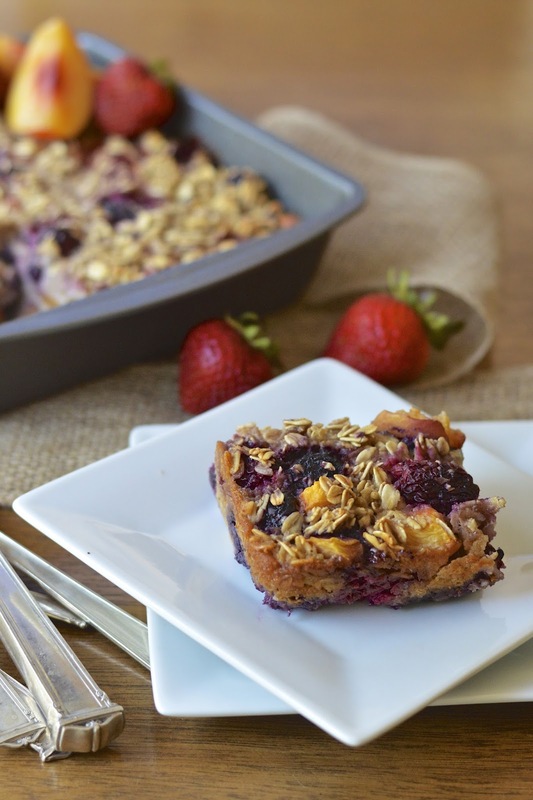 All you need to do is bake up the oatmeal mixture, cut it into squares, refrigerate and warm it up when you wake up. So easy, so good, so healthy! 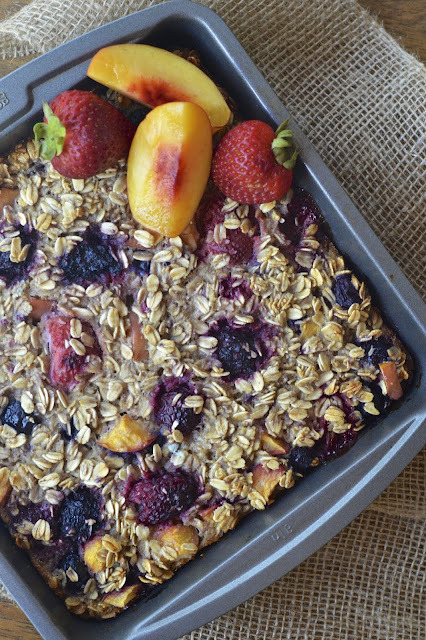 Aurorae yoga and this summer fruit baked oatmeal are a great way to start a productive and wonderful day. Preheat oven to 350° F. Spray an 8" x 8" baking pan with canola oil. 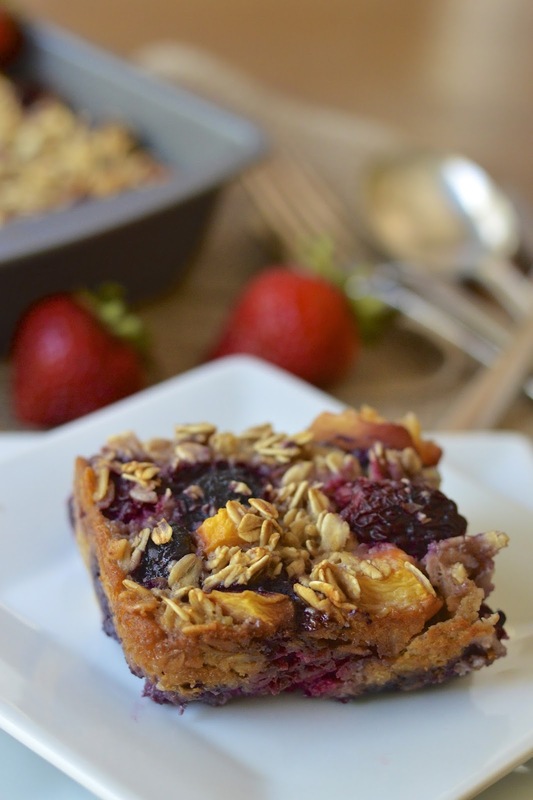 In a large bowl mix berries, oats, baking powder, sea salt and peach. In a small bowl whisk together milk, yogurt, maple syrup, vanilla and eggs. Pour milk mixture into oat mixture and stir until combine. Pour into prepared baking pan and bake for 45 to 50 minutes. Let cool and cut into squares. My favorite healthy breakfast is berries probably!